QinetiQ worked with the team within MPS whose role it is to ensure the integrity of ship magazine designs and that the safety clearances for the ammunition and explosives contained within them are in place prior to embarkation. In addition to this, MPS maintain the ammunition route drawings for each platform and endorse, with Naval Authority Group Explosives, the ammunition stowage plans for each magazine. They are responsible for a specific group of ships including HMS Ocean, HMS Illustrious, HMS Albion and Bulwark and Type 42 destroyers plus the forthcoming Queen Elizabeth Carrier Class. HMS Illustrious has previously been termed a support aircraft carrier (CVS) but in 2010 was permanently re-rolled as a helicopter carrier (LPH). Every ship in the Royal Navy requires an explosives safety case report. In 2011 stowage plans were produced for HMS Illustrious as part of a review of the entire CVS fleet to optimise ammunition outloads for the roles attributed to the ship. The stowage plans had been derived from a Threat Hazard Assessment (THA), where all credible threats to the magazines and stowages are considered. This assessment helps to ensure that the risks and hazards associated with CVS magazines and stowages containing the approved outloads are reduced to tolerable and As Low As Reasonably Practicable (ALARP). "We look to determine the extent of damage and casualty numbers as a result of an event in one or more of the ship’s magazines, also the probability of communication between magazines chains… The results of the Consequence Analysis are intended to inform the safety case report." An additional output of the THA is the production of a Ship Explosive Safety Case Report, a key part of this document is the requirement to produce a Consequence Analysis Model (CAM) which details the damage severity and casualties from an event or events. "We look to determine the extent of damage and casualty numbers as a result of an event in one or more of the ship’s magazines, also the probability of communication between magazines chains. For a ‘worst case’, consideration needs be given to cascade effects, burning and deflagrations based upon the energetic content of the magazines. The results of the Consequence Analysis are intended to inform the safety case report," said Andy Boulton, naval architect (ordnance munitions and explosives), Maritime Platform Systems, MoD. The CVS Class of vessels are the most complex ships in the fleet and have the most complex magazine arrangements primarily because the forces they transport (army, marines and various air squadrons) have a very wide variety of ammunition and are constantly bringing new variants and types of ammunition into service. 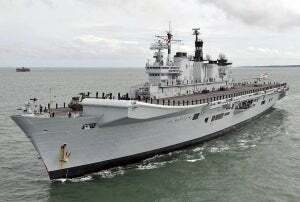 A team from QinetiQ Marine Survivability Services was tasked with the creation, development and support in the interpretation of a Consequence Analysis Model for HMS Illustrious. The development of the Consequence Analysis Model was placed with QinetiQ under the Maritime Strategic Capability Agreement (MSCA). This is a contract between MOD and QinetiQ which secures MOD access to a range of maritime engineering and scientific expertise and facilities. The MSCA provides essential capabilities needed to support the design, build, maintenance and operation of the UK’s ships and submarines. As part of the MSCA, QinetiQ provides specialist marine survivability services. "QinetiQ were the natural choice for this work given the extensive understanding they have of all aspects of survivability." In order to deliver the Consequence Analysis report QinetiQ combined the knowledge and experience of its survivability consultants with QinetiQ’s fully integrated survivability software (Survive®). "QinetiQ were the natural choice for this work given the extensive understanding they have of all aspects of survivability. Coupled with that, having the MSCA in place makes the contracting with them a very simple process," observed Andy Boulton. "From this data QinetiQ were able to rapidly build a model of the ship using Survive®. This allowed them to simulate different types of events such as an explosion in a magazine and its likely outcomes. In addition, Survive® allows the placement of personnel and equipment around the ship relative to the location of the magazines," commented Andy Boulton. By using Survive® along with the interpretive skills of the QinetiQ consultants they were able to run multiple scenarios to allow the prediction of damage to the ship and personnel from an event. This enabled QinetiQ to deliver a comprehensive report demonstrating the outcome of 16 events, two for each magazine on the ship. "We worked on the QinetiQ site with their survivability consultants on a number of occasions, which was very useful. Their work on building the model was invaluable. They helped us define how many events we would need to demonstrate to allow a comprehensive consequence analysis to be delivered. QinetiQ’s experience of survivability helped to accelerate the whole process to deliver a robust safety assessment. All in all QinetiQ gave us exactly what we wanted," observed Andy Boulton. The resulting explosives safety case was scrutinised by stakeholders in the MoD and was judged to be good and fit for purpose. "I would say we got excellent value for money given the time and effort that went into building the models and running the multiple scenarios. The QinetiQ Marine Survivability Services team are very knowledgeable and highly motivated. Coupled with their experience and the support of the Survive® software tool they really delivered against the contract for the development of a comprehensive Consequence Analysis report," commented Andy Boulton.